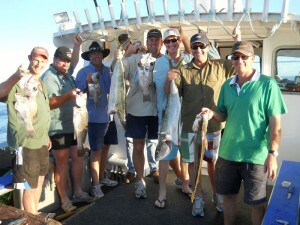 Trial Bay Fishing Charters are the Fishing Package Specialists. We would love to welcome you aboard the “LAUREN MAREE” our 40ft aluminium Charter vessel. The “Lauren Maree” is a 40ft custom built charter vessel, set up with the latest in fish finding equipment. We regularly cater to large groups, small groups, families and individuals to provide fun and exciting fishing experiences. Check out the Charters Page to see the packages we provide. Our accommodation is located a stones throw away from the South West Rocks Country Club and, with its four bedrooms and two bathrooms, is the largest accommodation of any currently on offer from the charters at the Rocks, making it convenient for large groups. Call or Email Allan or Brian to book your next holiday.